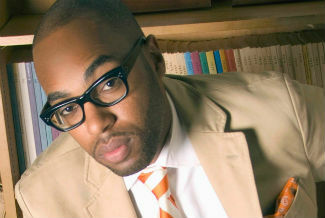 Professor, author, social critic, and science advocate Christopher Emdin discusses how to create and propagate a more effective and inclusive approach to STEM education that will increase student engagement and ignite their creativity during a free talk at the Moss Arts Center on Nov. 4 at 7 p.m. Presented in conjunction with the Virginia Tech Science Festival, “An Evening with Christopher Emdin: STEM Education and Empowerment for the Rest of Y’all” will be held in the center’s Anne and Ellen Fife Theatre, located within the Street and Davis Performance Hall at 190 Alumni Mall. The event is free and no ticket is required. Emdin will discuss what he sees as a gap between teacher knowledge, scientific knowledge, and where students exist in the education system, as well as how educators and administrators can work together to bridge this gap. An associate professor of mathematics, science, and technology at Teachers College, Columbia University, and director of science education at the university’s Center for Health Equity and Urban Science Education, Emdin advocates a STEM to STEAM approach, which involves integrating the arts into science classroom instruction. According to Emdin, the arts can introduce creative approaches and new perspectives for students, as well as give them permission to express themselves, question what they are learning, and develop a passion for it. He also stresses the importance of culture in this equation, arguing that teachers can make information more accessible and relevant when they have a better understanding of their students’ culture. The creator of the #HipHopEd social media movement, Emdin is the author of the New York Times bestseller “For White Folks Who Teach in the Hood and the Rest of Y’all Too.” His commentary on issues of race, culture, inequality, and education have appeared in dozens of media outlets, including the New York Times, Wall Street Journal, and Washington Post. Emdin is an alumni fellow at Harvard University’s Hutchins Center and currently serves as the Minorities in Energy Ambassador for the U.S. Department of Energy and STEAM Ambassador for the U.S. Department of State. This talk is supported by Virginia Tech’s Black Cultural Center. The Virginia Tech Science Festival, co-presented by the Institute for Creativity, Arts, and Technology; other partners at Virginia Tech; and the Science Museum of Southwest Virginia, is an expo-style, family-friendly event. The festival provides families with hands-on experiences, interactive demonstrations, and techno entertainment that will inspire a wonder in science for all ages.